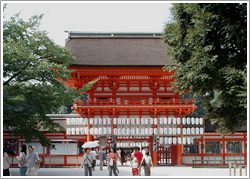 Shimogamo-jinja Shrine, also known as Kamomioya-jinja Shrine, is the family shrine of the Kamo clan, who inhabited this area before the transfer of the capital. 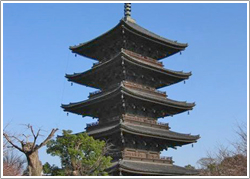 The 5-story 57 meter high pagoda has long served as a city landmark and a vibrant center for spiritual and community life. 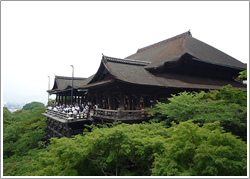 The expression "to jump off the stage at Kiyomizu" is the Japanese equivalent of the English expression "to take the plunge". 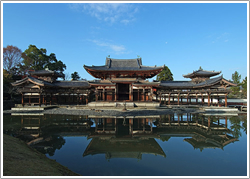 Enraku-ji Temple is said to be one of the main spiritual centers of Japanese culture. 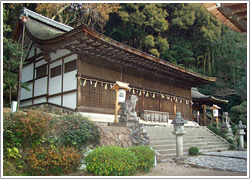 An ancient monastery complex atop Mt. 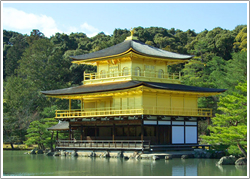 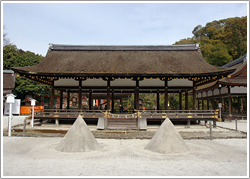 Daigo-ji Temple, a World Heritage Site, spreads across Daigo-san Mountain and is well-known as the "Temple of Flowers". 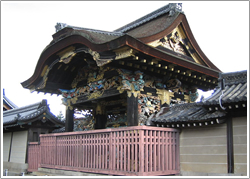 This temple was converted from a Fujiwara villa into a Buddhist temple in 1052. 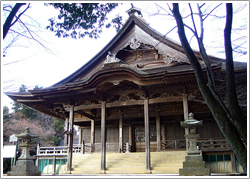 Ujigami-jinja Shrine is a remnant of the distant past, the oldest extant shrine in Japan. 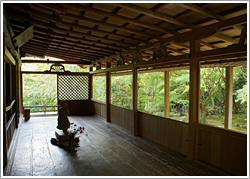 Kozan-ji Temple stands in a mountain forest. 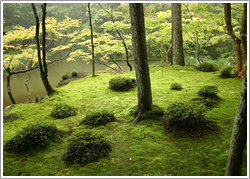 Towering cedar trees line the path to the temple and admit shafts of sunlight to the moss-covered ground. 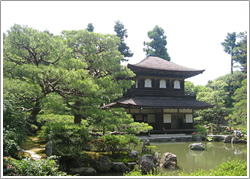 Visiting Saiho-ji Temple is a unique experience which affords one the opportunity to view a garden of rare beauty in a temple which preserves a serene and dignified atmosphere. 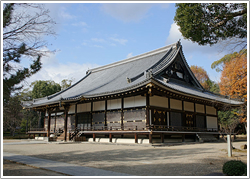 Tenyru-ji is a major temple of the Rinzai School. 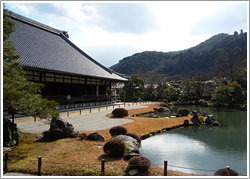 It was built in 1339 on the former site of Emperor Go-Daigo's villa after a priest dreamt of a dragon rising from the nearby river. 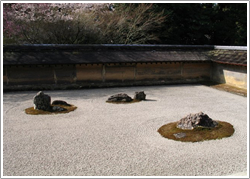 Ginkaku-ji (Temple of the Silver Pavilion) is the more common name for Jisho-ji Temple, a temple belonging to the Buddhist Shokoku School of the Rinzai Zen sect. 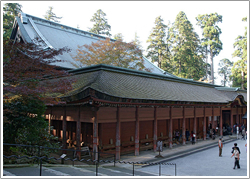 Nishi-Hongan-ji is the headquarters of the Jodo-Shin sect of Buddhism, which has the largest number of adherents of any sect in Japan. 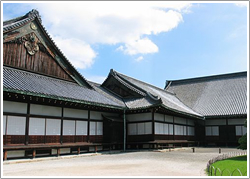 The ostentatious style of this castle was intended as a demonstration of Shogun Tokugawa Ieyasu's prestige.